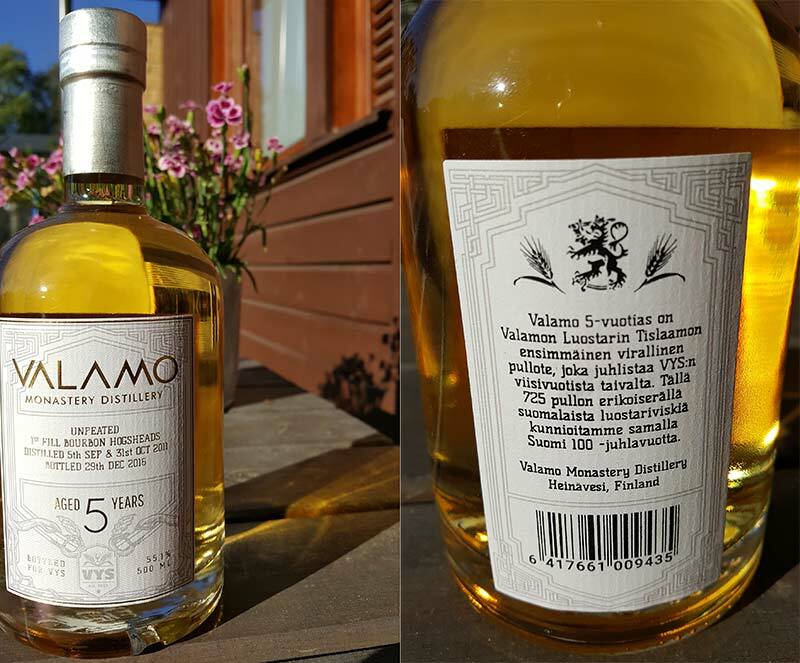 This 5 year old unpeated single malt whisky is the first official release by Valamo Monastery Distillery from Finland. Bottled at 55,1% ABV, this is a special edition release of 725 bottles in honor of the 5 year anniversary of VYS (Viskin Ystävien Seura = Fellowship of Whisky, Finland). This whisky also celebrates Finland’s 100 years of independence in 2017, while the bigger batches will be released in 2018. Valamo’s first (unofficial) releases contained malts from Belgium, but I believe that for this first retail whisky, they’ve already had some Finnish malt. The label doesn’t state it, but Valamo 5YO unpeated has to be without added colour – it’s so light. The whisky has been distilled on 5th of September and 31st of October in 2011. Matured in first fill bourbon hogsheads and bottled on 29th of December in 2016. Fast and Furious or was it? Nose: Quite mild first, with hints of vanilla and toffee. Let it open up, water adds some oak and peppers. With time it gets nicely smooth and the aromas of vanilla and toffee are stronger. Bit one-sided. Taste: Peppery with hints of butterscotch. Water brings out the peppers even more, and some major oak feel. This one needs to rest quite long, making it more smooth. Creamy toffee starts to dominate nicely if you give it some time and water. Finish: Creamy toffee is present in the finish as well, this time it’s more powerful. Peppery kick comes very early in the finish and bitter notes rise very late in the aftertaste. Balance: Powerful dram but the first impression feels a bit too bitter for me. Feels like this junior needs more maturing. Eventually it opens up and feels better and better with every sip. I’ll have to let it rest in my cabinet, get some oxidation and see if that makes it even better. Let’s keep in mind that this was my first pour, so I have to get back at it and re-examine this whisky.